search.searchfdm.com is a browser hijacker that is promoting a dubious search engine. Browser hijackers usually spread with the help of free software. They are attached to the freeware as additional items. 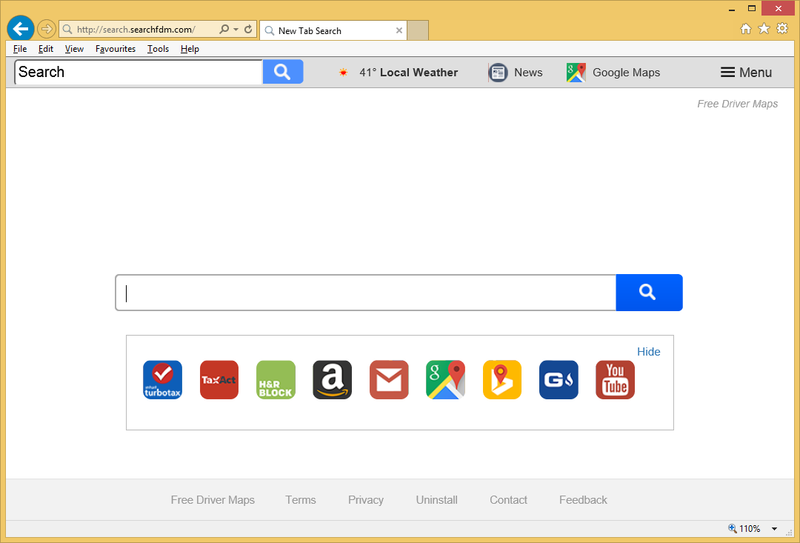 If you install this hijacker, next time you open your browser, you will notice that your homepage has been changed. Hijackers change browser’s settings and aim to redirect you to sponsored pages. By generating traffic, it makes income for those sponsored web pages. That is the primary reason why it exists. It will not harm your computer but that does not mean it is harmless. Those redirects that will be occurring may not always lead to secure web pages. You could end up on a malicious web page and download some kind of malware by mistake. This is why it is recommended that you delete search.searchfdm.com. Browser hijackers always use the same method to spread. It is referred to as the bundling method and that means that hijackers are attached to free software. They are set to install automatically alongside the software, unless the user deselects them. In order to be able to do this, you must choose Advanced or Custom settings during freeware installation. You will see a list of what has been added and will be able to deselect everything. Essentially, all you need to do is uncheck a couple of boxes, so it does not take any extra time. Do not rush through the installation process in Default settings because then you will be stuck having to remove search.searchfdm.com and similar again. If you have allowed this hijacker to install, it will become the homepage and new tabs of all your browsers. So every time you open your browser, be it Internet Explorer, Google Chrome or Mozilla Firefox, you will be redirected to search.searchfdm.com. The browser’s settings have been changed without your permission and you will not be able to undo them unless you first delete search.searchfdm.com from the system. It has a couple of links to web pages like Yahoo, Google Maps, YouTube, etc., and a search bar. If you were to use the search bar, you would be taken to Saferbrowser Yahoo, where you might encounter many sponsored pages. This is not unusual as hijackers aim to redirect as many users as possible to those sites. While pretty harmless most of the time, some websites may be harmful to you. Malware could be lurking on one of them and you could end up downloading it. In any case, browser hijackers are rather useless to you as they provide nothing of value. We suggest you remove search.searchfdm.com. To uninstall search.searchfdm.com, you may need to obtain professional removal software. The program would take care of search.searchfdm.com removal for you. But if you want, you can also erase search.searchfdm.com manually but you will have to locate the hijacker yourself. Instructions to help you eliminate search.searchfdm.com will be provided below.